UPDATE: This entry has been edited to remove references to an article about gems being produced by Kilauea Volcano after debunking Thursday by scientists. National Politics Percolate At ‘Hawaii On The Hill’ Event In DC. It’s not all about poke bowls and Spam musubi. The annual Chamber of Commerce event gives some island leaders a firsthand look at national issues. Civil Beat. 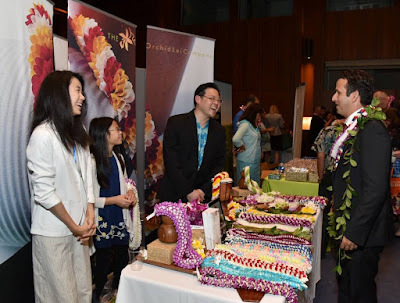 The Hawaii Congressional delegation joined local government officials, small business owners, and educators at the 5th annual Hawaii on the Hill events on Capitol Hill on Wednesday. Garden Island. Unite Here Local 5, which represents about 11,000 Hawaii hospitality, health and food service workers, endorsed Kim Coco Iwamoto for lieutenant governor on Wednesday. Star-Advertiser. Super PAC Dumps A Quarter-Million Dollars Into LG Race. The pro-rail carpenters union is backing state Sen. Josh Green, but one political analyst questions whether it’s payback against another candidate. Civil Beat. The state of Hawaii is banning a pesticide scientists have found could hinder the development of children’s brains. Associated Press. Hawaii became the first state in the country to ban pesticides containing chlorpyrifos, a chemical that has been linked to disruptions in the brain development of babies and young children, with Gov. David Ige signing the measure into law on Wednesday. Star-Advertiser. Gov. David Ige signed SB3095 Wednesday, which bans the use of pesticides containing the potentially harmful chemical chlorpyrifos starting in 2023. Big Island Video News. Hawaii became the first state in the nation to ban chlorpyrifos with the Wednesday signing of SB3095 by Gov. David Ige. Garden Island. Hawaii Becomes First State to Ban Neurotoxin, Chlorpyrifos. Hawaii Public Radio. Governor David Ige signed a law Wednesday, banning the use of pesticides containing chlorpyrifos. KITV. Gov. Ige Asks FEMA to Reconsider Request for Kauai & Oahu. Big Island Now. Gov. David Ige is asking the Federal Emergency Management Agency to reconsider its initial denial of the state’s request for individual assistance for Kauai and Oahu residents affected by April’s severe storms and flooding. Garden Island. The Hawaiian Electric Cos. have filed their Electrification of Transportation Strategic Roadmap (“EoT Roadmap”) with the state Public Utilities Commission. Star-Advertiser. The mayors of Hawaii’s four counties are pushing ahead in their pursuit of electrifying the state’s transportation sector by signing a memorandum of understanding on Wednesday to formally join Drive Electric Hawaii. Pacific Business News. Pasha Hawaii receives 600 new refrigerated containers as part of expanded Hawaii service. Pacific Business News. Blood Bank Paying A High Price In Its Dispute With Honolulu Rail Officials. The nonprofit wants to abandon its headquarters long before trains start rumbling nearby. But the city is offering to buy only a strip of landscaping. Civil Beat. More frustration for Oahu residents trying to renew their driver's licenses. KHON2. The state is investigating a case of Legionnaires’ disease, a potentially deadly form of pneumonia caused by a bacterial infection. Star-Advertiser. Six isolated cases of Legionnaires' disease confirmed in Hawaii this year. KHON2. The state Department of Health announced on Wednesday that they are investigating a new case of legionellosis on Oahu. Hawaii News Now. Union hopes nonprofit, trust fund will help its members buy homes. Star-Advertiser. Longtime leader of St. Francis School ousted. Sister Joan of Arc Souza, who led St. Francis School in Manoa for 27 of its 94 years as its head of school and principal, was no longer employed at the school as of Monday. Star-Advertiser. A Honolulu-based hotel company has sold six of its Asia-Pacific properties to a Thai-based property development and investment holding company for $310 million. Associated Press. Solar permits issued on Oahu rose 42 percent in May to mark the fifth straight month of increases. Star-Advertiser. ‘The Last Wild Place’ Wins National Honors. Civil Beat took readers on a visual journey through one of the most remote parts of the planet. Civil Beat. Ige seeks assistance from federal programs. Gov. David Ige said Wednesday that Hawaii County estimates lava has destroyed approximately 455 dwellings in Leilani Estates, Lanipuna Gardens, Vacationland and Kapoho Beach Lots, of which 192 are primary residences. Many other homes throughout Puna have been cut off by lava or are uninhabitable due to poor air quality from volcanic gases. Star-Advertiser. Federal aid for people affected by the Kilauea eruption might be approved soon after Gov. David Ige signed a request for such assistance Wednesday. Tribune-Herald. Hawaii governor asks FEMA to OK individual assistance for lava claims. State agencies, the county government and nonprofit organizations have been providing assistance to individuals so far; the state has no individual assistance programs, the governor’s office said. Pacific Business News. County hoping Disaster Assistance Center can open by weekend. Tribune-Herald. Mayor Harry Kim is hoping to have a conceptual plan for a Kaikoo-style redevelopment project to help those displaced by the Kilauea eruption drafted within a month. Tribune-Herald. Hawaii mayor wants to relocate those displaced outside zones one or two. KITV. Website aims to provide displaced lava evacuees with housing. KITV. The incredible scope of the Big Island eruptions, a disaster with no end in sight. Hawaii News Now. Farmers among hardest hit by eruptions with losses of more than $14M. Hawaii News Now. Overflight Video: Rivers of Lava. Big Island Now. VIDEO: Drone Captures Dramatic Drop At Kilauea Summit. Big Island Video News. The National Weather Service reported Wednesday that light winds will bring vog inland and to the south, wrapping around to the Kona area. West Hawaii Today. Distant Eruption Has Major Impact On Kona-Kohala Coast. West side residents and businesses are dealing with vog and a downturn in business, including some people cancelling their visits. Civil Beat. Relief greets Pride of America’s return to Hawaii Island ports. West Hawaii Today. Hundreds of animals among lava refugees. The humanitarian crisis in its sixth week on Hawaii island, forcing more than 400 people into shelters and away from erupting lava, also has taken a toll on animals in the area. Star-Advertiser. Maui Renters Need to Work 123 Hours a Week to Afford 2-Bedroom Apartment. Maui Now. DLNR Seeking Comments on Draft EIS for Business Park. The 280-acre DLNR Industrial and Business Park is located along Maui Veterans Highway (formerly known as Mokulele Highway) adjacent to the Hawaii National Guard Armory and the County Raceway Park in Central Maui, in the vicinity of the former Naval Air Station Puunene and Maui Humane Society. Maui Now. In the wake of the Kauai floods and volcanic activity on Hawaii Island, Kahuku Medical Center has raised $15,000 for the American Red Cross of Hawaii to support disaster relief efforts and those affected by recent natural disasters. Garden Island. The southbound lane of Kuhio Highway between Nuku Street and Kapaia Road will be closed from 8 p.m. to 5 a.m. beginning Wednesday, June 20, and Thursday, June 21. The closure is necessary to allow the Wastewater Management Division to continue a sewer main repair in the area. Garden Island.